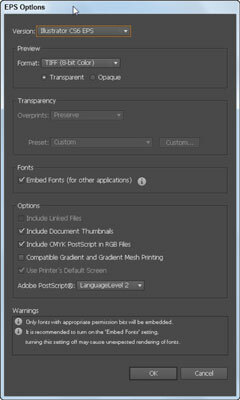 Adobe Illustrator CS6 allows you to save documents in an EPS format. Encapsulated PostScript File (EPS) is the file format that most text editing and page layout applications accept; EPS supports vector data and is completely scalable. Because the Illustrator .eps format is based on PostScript, you can reopen an EPS file and edit it in Illustrator at any time. Choose File→Save As and select EPS from the Save As Type drop-down list. From the Version drop-down list, select the Illustrator version you’re saving to. Select either the Transparent or Opaque radio button, depending on whether you want the non-image areas in your artwork to be transparent or opaque. These settings are grayed out if you haven’t used transparency in the file. Leave the Embed Fonts (for other applications) check box selected to leave fonts you used embedded in the EPS file format. In the Options section, leave the Include CMYK PostScript in RGB Files check box selected. If you don’t know which Adobe Postscript level you want to save to, leave it at the default. Click OK to save your file in EPS format.